Creekside Court is situated on a unique 3/4 of an acre of private forested back yard. Babbling stream included. Located at the end of a quiet cull-de-sac, in a well established neighbourhood. Where neighbours still wave to each other and say hello! A place where your family can go for a walk and feel safe. The majority of our clients are tired of hotels, eating in restaurants and just want to have a home away from home. 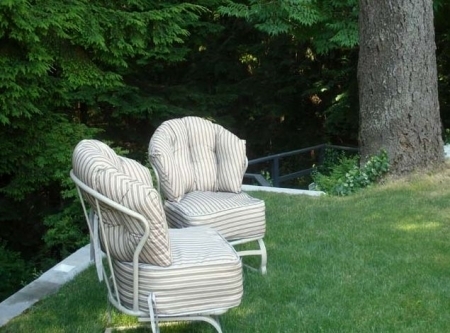 Somewhere that they can BBQ, sit outside in a peaceful setting, close to nature and relax. Our suite also provides you with the opportunity, if you are relocating, to decide where you want to live before committing to an area you are unfamiliar with. The suite has over 1100 square feet and features a separate entrance, in a park like setting. 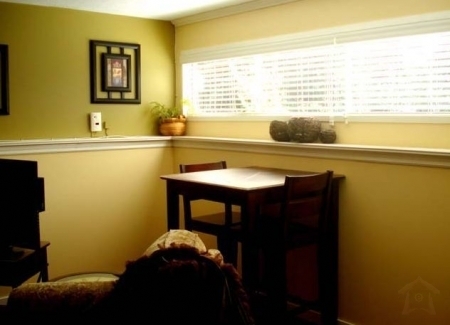 We have just completed renovating it (Jan 2009) and has all new quality hardwood flooring, lighting, window coverings. The spacious living room features a gas fireplace (which you control) new high end furniture, large ottoman, end and sofa tables, Flat screen LCD, DVD and wireless internet. There is also a pub style table suitable for working off your lap top while having a beautiful view towards the forest. The vacation rental suite has a large maple kitchen with a table for four, full size fridge/freezer, stove, microwave, quality dishes, pots and pans. There is a new stainless BBQ as well as patio furniture for you to lounge and enjoy a beverage after work. We have a fresh herb garden and feel free to pick the tomatoes when in season. Next to the kitchen is a private (Not Shared)) laundry and storage room equipped with a full size washer and dryer, iron and ironing board. This is also a perfect area to store your tools and or equipment. 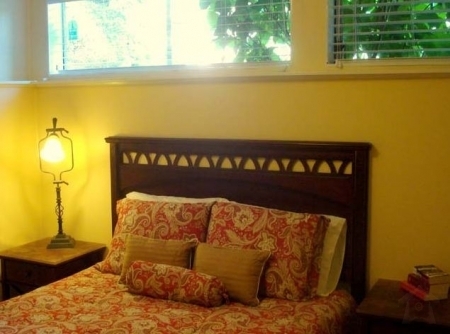 The bright bedroom has a queen size bed with quality linens, new mattress, box spring and duvet. The den features a double bed (with a full set of linens / duvet and pillows for those overnight guests). This area can also be used as an office or study area if you choose. The bathroom has a shower, pedestal sink and a dual flush toilet and is complete with towels. 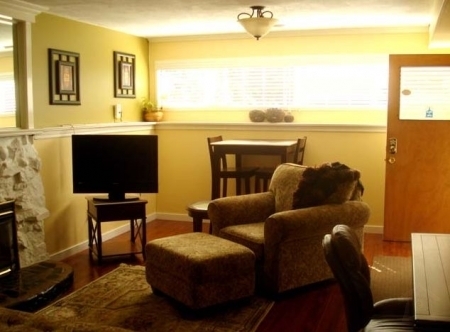 The basement suite is super clean and bright, with large windows in every room. Typically our guests are in the construction or film industry, relocating to the area, separation or construction / real estate delays. 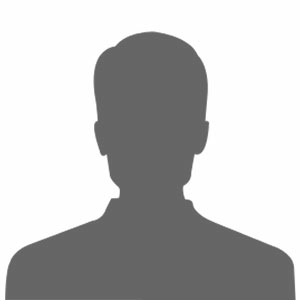 We respect your privacy as you would ours, but are here if you require anything. Our client list include Leavitt Machinery, Vanguard Studios, Royal Bank. KWH Constructors. Our corporate stays have been in excess of 7 months. Extreme high speed internet hook up (wireless), cable and all utilities are included. Parking is on street / or off street. We also have room if you have a boat or oversized work vehicle. Occasionally we receive requests in regards to children staying.. Children are welcome, but due to the nature of the property they must be supervised at all times. Smoking is permitted outdoors. Suite must remain smoke free for the comfort of our guests. A small, well behaved (and supervised) pet may be considered. There is a nice side yard for your pet and we are close to great dog walking parks. If you are looking to hang your hat short term, then this may be for you. Housekeeping is also available.